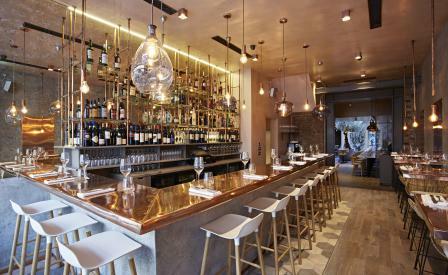 Perhaps aptly located on Hollywood road in London’s affluent borough of Chelsea, Bandol is the new sister restaurant to the often celebrity frequented Margaux. This time round, husband and wife team Sylvia Kontek and Vittorio Monge have focused on the South of France for the food, wisely assigning chef Zsolt Ferencz (ex Scott’s) to create a distinctly Mediterranean menu seen best to effect in the choice of seafood dishes from sardines provencal to yellowtail carpaccio and salted cod croquettes. A series of small sharing plates are light and compact with the flavour of herbs and olive oil notes, and heartier mains such as the succulent rack of lamb or the duck leg confit hit the spot for a cosy winter lunch fuelled by a satisfying selection of regional wines. Much like Margaux, the eaterie - designed by local studio KKD - opens with a copper-topped bar, establishing the theme for a mostly copper-clad space, tempered with smooth oak flooring and low-hanging pendant lighting. The casual dining room then leads to the main restaurant where a skylight casts a pale lustre onto the olive tree that takes centre stage. With very little fanfare, Bandol seems to be well on its way to acquiring the star status set by its sibling, down the road.